A decade and half after mastering martial arts in Japan, Shihan Dana Abbott returned to Scottsdale, Arizona and opening Samurai Sports, Inc. and the Samurai Sports Training Center to introduce Japanese swordsmanship to the martial arts industry. He offers a viable way to learn and instruct the Japanese sword to anyone who wishes to learn. 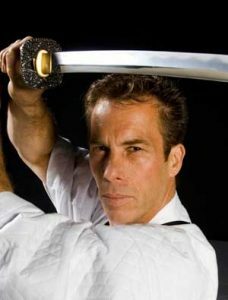 Shihan Abbott invented and patented the ActionFlex combative sword, which is now commonly used throughout the world. Samurai Sports’ instructors include Shihan Dana Abbott and nationally and internationally known martial artists and visiting masters from Japan. If you choose to spend time training with us, the Samurai Sports Training Center is close to freeways, hotels and amenities. It has a traditional, multi-room interior, showers and air conditioning. Shihan Dana Abbott offers private and semi-private classes in his local Scottsdale, Arizona area as well as intensive courses/seminars for martial arts school owners and instructors throughout the United States. Classes at the Samurai Sports Training Center are conducted 7 days a week to accommodate your busy schedule.